Over the last few years, I’ve had the privilege (and misfortune 🙂) of using hundreds of online marketing tools. Thanks to an active subscription of AppSumo’s Briefcase as well as multiple purchases made via AppSumo every month, I’m always testing new tools and software that will help me get better at marketing, not just for the sake of my blog, but also for the sake of my clients at my digital marketing agency. 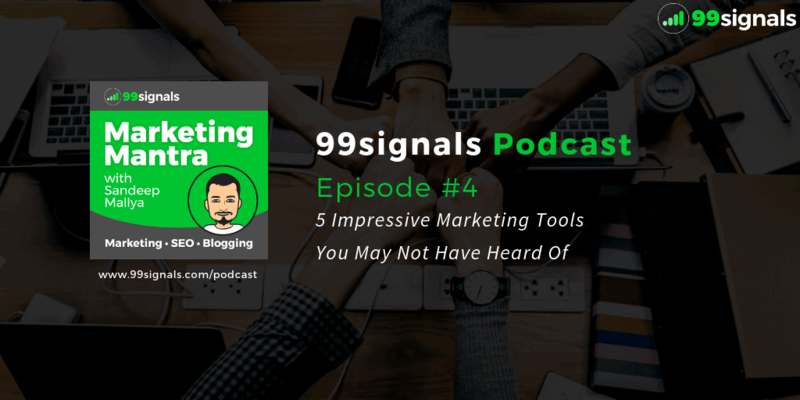 In this week’s podcast (episode #4), I’ll reveal 5 impressive marketing tools that are not mainstream yet, but are well on their way to achieve stardom because of the incredible value they bring to marketers, bloggers, and entrepreneurs. You’ll find links to all 5 marketing tools discussed in this episode in the full podcast transcript below. Thanks for listening and I hope you enjoy this episode! Subscribe to the 99signals podcast, Marketing Mantra, where I share the latest and best online marketing strategies, actionable tactics, news, insights, and much more. Hello everyone! 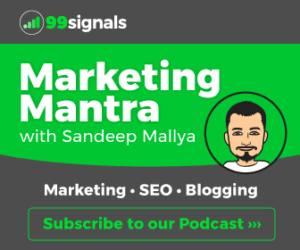 Welcome to another episode of the Marketing Mantra podcast, brought to you by 99signals.com. 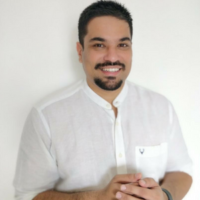 My name is Sandeep Mallya and in this week’s episode, I’ll be talking about 5 Impressive Marketing Tools You May Not Have Heard Of. Before we get started, I’d just like to let you know that links to all the tools discussed in this podcast will be provided in the description. These tools that we are about to discuss may not be very popular now, but they soon might be because of their exceptional capabilities and functionalities. And some of them even have free versions. So start using them before they stop being affordable. Rocketium is a video creator which can help you create Buzzfeed-style videos in under 5 minutes. What I mean by this is that you can quickly create videos with text overlay. These videos are frequently used by websites like Buzzfeed, Business Insider and Mashable on their social platforms. With Rocketium, you can create similar videos for your social channels. You can create horizontal, square, and portrait videos at the same time for YouTube, Instagram and Snapchat respectively with a feature called intelligent auto-sizing. It’s a beginner-friendly tool with a lovely interface and a variety of video templates to choose from, and you don’t need any design or video-editing skills whatsoever. When it comes to pricing, they have a free version which allows you to create 30-second videos and you can create up to 10 videos per month. If this limit bothers you, then you can upgrade to the Professional plan which will cost you $49/mo. Once again, the tool I’m talking about here is called Rocketium. Promo Republic is a social media content creation and automation tool. It features a post ideas library with thousands of templates, visuals, stock photos and an easy-to-use graphics editor. You’ll find over 6,000 social media templates, handcrafted by a team of professional designers and copywriters. You can customize these templates as you wish, insert your logo, and publish them into all the major social media platforms. You don’t need any design skills whatsoever. Imagine this tool to be a combination of Canva and Buffer. You have a powerful graphics editor plus a social media scheduling tool all packed into one. Pricing starts from $9/mo. Once again, the tool I’m talking about here is called Promo Republic and it’s an excellent resource for all marketers who’d like to create more engaging photos on social media. TARS enables individuals and businesses to create chatbots that can be used on your website and Facebook Messenger with no programming knowledge at all. The chatbots created via TARS can be used for ordering/booking process, feedback collection, surveys, training, customer support automation, and a lot more. We used TARS to create our own content marketing chatbot at 99signals. So just head over to our blog to see a live example of a chatbot created through TARS. When it comes to pricing, they provide a free trial for two weeks. You can create your chatbot for free on the platform and test it on your website for two weeks. Once that is over, you’ll need to upgrade of their paid plans. They recently changed the pricing of their services. The standard plan was $49/mo which allowed you to create 5 chatbots, but with the new pricing structure, you’ll need to pay slightly more. Once again, the tool I’m talking about here is called TARS and if you’re looking for an easy way to build a chatbot for your website without any hassle or spending too much money, this is the perfect solution for you. Poplink is a highly useful tool if you like content curation. Poplink lets you send visitors to your website or app while you’re sharing third-party content on your social channels. For example, let’s say you find a fascinating SEO article on the SEMrush blog and you’d like to share it with your audience on Twitter. At the same time, you want users to visit your blog which has similar content to that of SEMrush or perhaps even offer your SEO services. All you need to do is head over to Poplink and create a promotion. Treat it like you’d create a PPC ad on Google AdWords with headline, description, and the link you want to promote. Poplink even gives you an option to insert your logo to generate branded promotion links. Now you need to copy the SEMrush article URL and paste it into the Poplink box. Poplink will create a shortened link and to this link, you can add the promotion that you just created. This link can then be shared on Twitter or any of your social channels and the clicks can be tracked on Poplink. Poplink tracks everything: Not just the visits to the article, but also visits to your website through the promotion link you created. It’s an awesome way to drive referral traffic back to your website. You can start using Poplink for free. The free version allows you to create 20 poplinks and 2 promotions per month. If that’s not enough for you, you can upgrade to the personal plan which is $10/month and it allows you to create 500 poplinks and 20 promotions per month. Once again, the tool I’m talking about here is called Poplink and it’s a great way to drive referral traffic to your website while sharing other people’s content. Keyword Hero allows you to get your organic keywords displayed in Google Analytics. If you’ve used Google Analytics to track your website traffic, then you’d know that Google hides this information from you. You can’t see majority of the keywords that people actually typed into the search box to get to your website. With Keyword Hero, you’ll get information on up to 95% of these keywords compared to 3% – 8% which you’d normally get with Google. With this knowledge, you can tweak and optimize your content accordingly and even create extra content on your website for the keywords discovered through Keyword Hero. This tool will give you a serious competitive advantage over anyone who’s competing for the same keywords and users. To start using Keyword Hero, you need to integrate it with Google Analytics. Luckily, it’s a simple process and it takes just about 2 minutes to complete the integration. When it comes to pricing, you can start using Keyword Hero for free. The free version lets you track keywords for 25 most frequented URLs from your website. 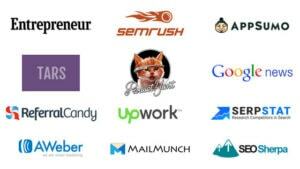 The paid plans start from $19/month which lets you track 250 URLs from your website. Once again, the tool I’m talking about here is called Keyword Hero and it’s the perfect keyword research tool for bloggers and SEOs. That’s it for this episode of the Marketing Mantra podcast. Thanks for tuning in and I hope you really found this episode useful. Start using these 5 marketing tools that I discussed, give me your feedback, and if you’re listening to this podcast on Anchor, feel free to leave a voice message with questions or your recommendations. I’ll be glad to hear them and I’ll address them in the next episode. This is Sandeep Mallya signing off and I’ll see you guys next week with a new episode of the Marketing Mantra podcast. Liked this episode? Please feel free to drop a message at podcast@99signals.com for any thoughts, ideas, or feedback. If you found this episode useful, it’d mean the world to us if you could share it on Twitter with your followers or share it on any of your other social channels using the social bar on the left. 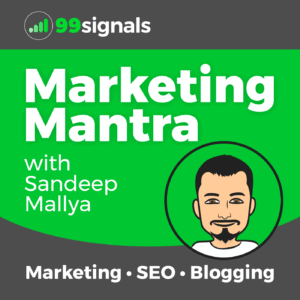 Marketing Mantra is a weekly podcast by 99signals.com, hosted by Sandeep Mallya. If you’re an entrepreneur, blogger, small business owner, marketer, or someone simply interested in marketing, you’re sure to find something useful and interesting in each episode.